Former Florida Gov. Jeb Bush says now is not the right time for him to return to elected office. (CNN) - Former Florida Gov. Jeb Bush, President Bush's younger brother, has decided he will not seek Florida's open senate seat in 2010, setting off what's sure to be a wide-open and hotly contested battle to replace Republican Sen. Mel Martinez. In a statement released Tuesday, the younger Bush said the time isn't right him to return to public life. “While the opportunity to serve my state and country during these turbulent and dynamic times is compelling, now is not the right time to return to elected office," Bush said in the statement. “In the coming months and years, I hope to play a constructive role in the future of the Republican Party, advocating ideas and policies that solve the pressing problems of our day. 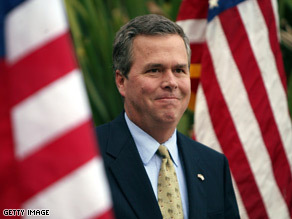 Bush was elected governor of Florida in 1998 and 2002 and was considered a leading contender for the seat set to be vacated by Martinez. His presence in the race would have added immediate star power to a contest Democrats are likely to make their top target in 2010. But the former governor, who has largely remained out of the spotlight over the past two years, would likely have been hindered by his close association with the unpopular outgoing president, whose approval ratings continue to hove around 30 percent nationally and even lower in Florida. But Jeb Bush left office in 2007 with approval ratings well over 60 percent, a sign he would likely have been insulated in the state from his brother's unpopularity, and among Florida Republican's best hopes for retaining the seat. Since exiting the governor's office, Bush has served on the board of Tenet Healthcare Corporation. He also joined the now-defunct investment bank Lehman Brothers in 2007 as an adviser to its private equity business. According to published reports, Democrats view Alex Sink, the state's chief financial officer, as the candidate best positioned to run for the seat. Before Martinez's announcement, Sink suggested she was uninterested in the run, but it's likely she now may reconsider. Democrats are also considering Rep. Debbie Wasserman Schultz, a high-profile supporter of Sen. Hillary Clinton's presidential bid, though Schultz's congressional spokesman said it is unlikely she will run. Other Democrats mentioned include Reps. Kendrick Meek and Allen Boyd. On the Republican side, Reps. Vern Buchanan and Connie Mack are said to be interested, as well as several GOP state officials. “I think it will mean a very bloody primary for us and possibly for the Democrats. His candidacy would have cleared the field for Republicans. I cannot imagine the craziness,” a Florida GOP strategist told CNN Political Editor Mark Preston. The strategist said that several Republicans could now jump in the race including U.S. Rep. Connie Mack, state Senate President Jeff Atwater and former state House Speaker Marco Rubio. The GOP strategist noted that Democrats might also see a primary because Bush “had the ability to knock the Democrats out,” who might have taken a pass. Should Sen. Mel Martinez retire from the Senate early, it would avoid a Republican primary fight because Republican Gov. Charlie Crist would make the appointment and give that appointee the power of incumbency. Of course he's not. He wants to run for president and ruin the Country just like the other two bushes did. I am not rooting for him and no one should. Why would he run for senator in 2010 when he can run for president in 2012!!!!!! I agree him and Palin, god I hope its going to be another early primary because I never laughed so much in my life. You can't pay for this kind of entertainment with both of those Idiots together. Bring it on.